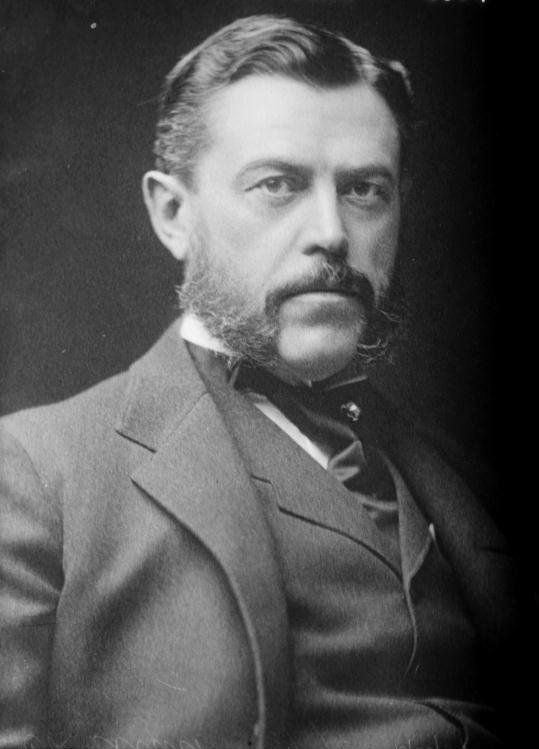 January-Februaury  International financier Charles Flint learns of the Wrights' achievement and negotiates a deal to act as their agent in Europe. His reputation lends great credibility and gravity to all their efforts to sell their invention. 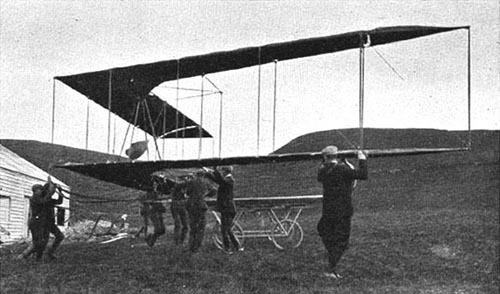 March  Gabriel Voisin and his brother Charles build and fly a modified Chanute glider with a box-kite tail. This will be the configuration for their first successful airplanes. 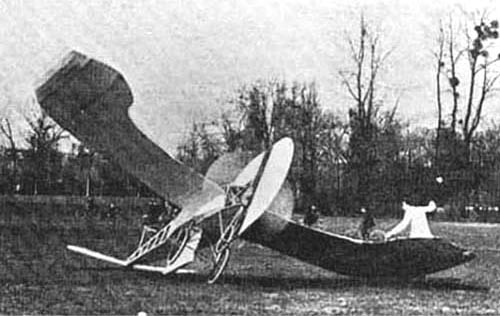 April 5  Louis Blériot tests the first of his monoplanes, the Blériot V. It flies only 6 meters before crashing. 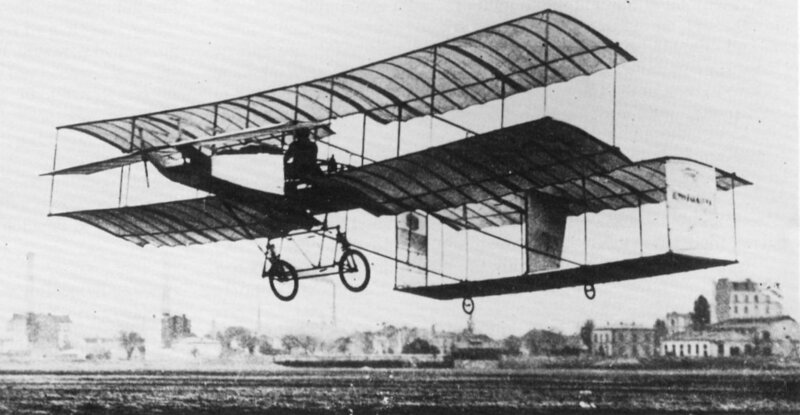 May 27 Wilbur Wright arrives in Paris to test the market for airplanes. 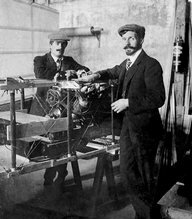 Later he is joined by his brother Orville and Charlie Taylor after they complete an aircraft (the first Wright Model A) and ship it to France. While in Paris, the Wrights meet with Frank S. Lahm and his son Lt. Frank P. Lahm, who is visiting his father. 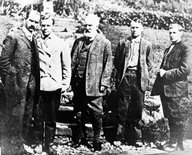 July  Alexander Graham Bell, Canada, Glenn Curtiss, United States, Lt. Thomas Selfridge, United States, John McCurdy, Canada, and Casey Baldwin, Canada, form the Aerial Experiment Association. July  Lt. John W. Dunne, working at the Army Balloon Factory in England, tests the first top-secret military aircraft, a two-passenger swept-wing glider with no tail. It is the first "flying wing." 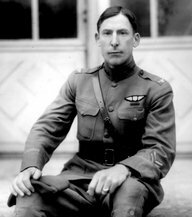 It flies for 8 seconds on its first flight, then crashes injuring a passenger, Lt. Col. John E. Capper. Despite the accident, the design shows promise and Dunne's secret work continues. 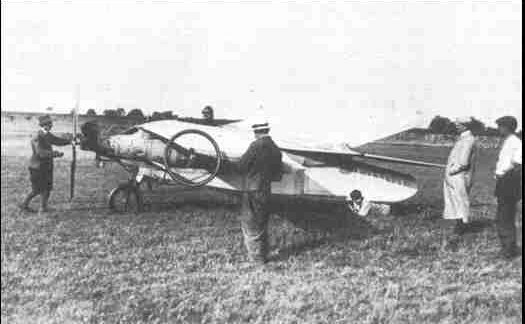 July 25  Louis Blériot tests another monoplane, the Blériot VI. It flies 150 meters (492 feet). Later, he will fly 184 meters (604 feet)in a modified version. 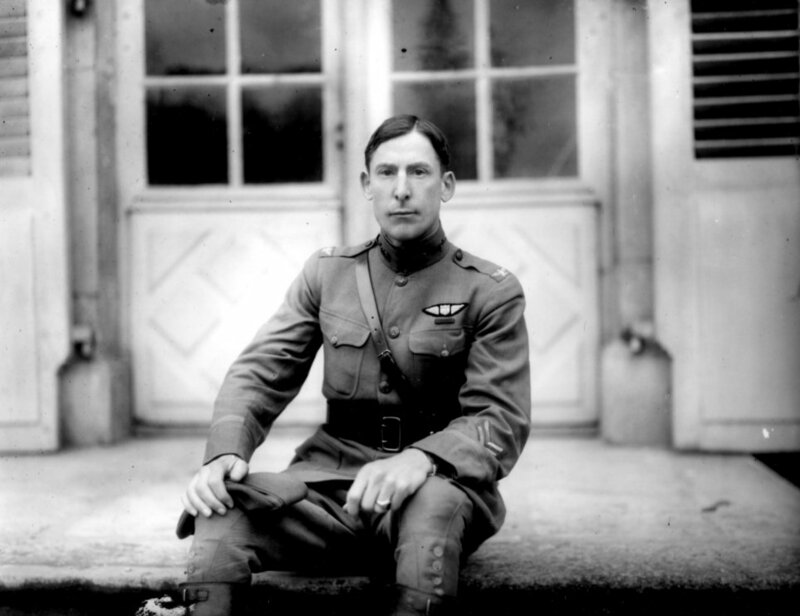 August 1  Gen. James Allen, Chief of the US Army Signal Corps, issues an order creating the Aeronautical Division and placing Captain Charles Chandler in charge. This is the very beginning of the US Air Force. 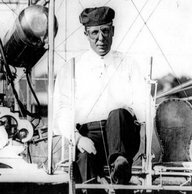 September 17  Lt. Frank P. Lahm, son of balloonist Frank S. Lahm and winner of the Gordon Bennett Cup for ballooning, joins the Aeronautical Division. He writes a letter to his superiors that finally wakes them up to the accomplishments of the Wright brothers. 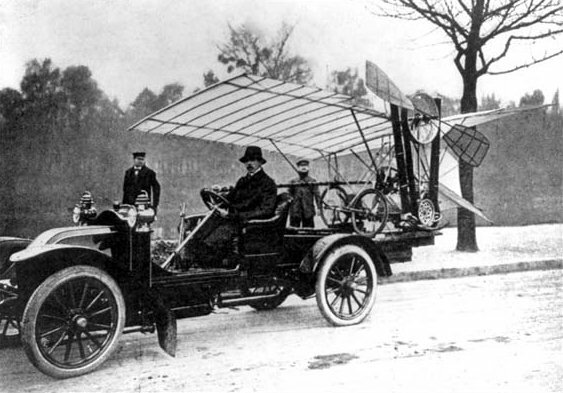 September 30  Henri Farman, England, turns up at the Voisin factory in France and buys an airplane. He makes a short hop of 30 meters (98 feet). October 15 to 26  Henri Farman modifies the plane with a single-surface front elevator instead of the double-surface Wright-style elevator. He also replaces the tail with a smaller unit and adds wing dihedral. He makes several flights, the longest of which is 771 meters (2530 feet). 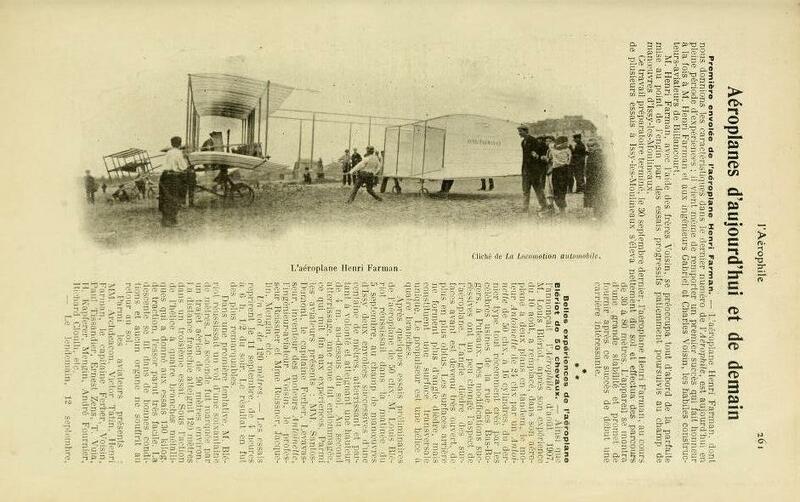 The Coupe Ernest Archdeacon trophy passes from Santos-Dumont to Farman and he collects the Aéro-Club de France prizes for the first flights of 300 and 500 meters (984 and 1640 feet). October 24  Carl Dienstbach and Capt. Alfred Hildenbrandt, Germany, arrive in Dayton, Ohio to interview witnesses to the Wrights' flights at Huffman Prairie and confirm their claims. November  The Scientific American in cooperation with the Aero Club of America offers a prizes of $2,500 and a trophy for the first flight in America of one kilometer (3281 feet). 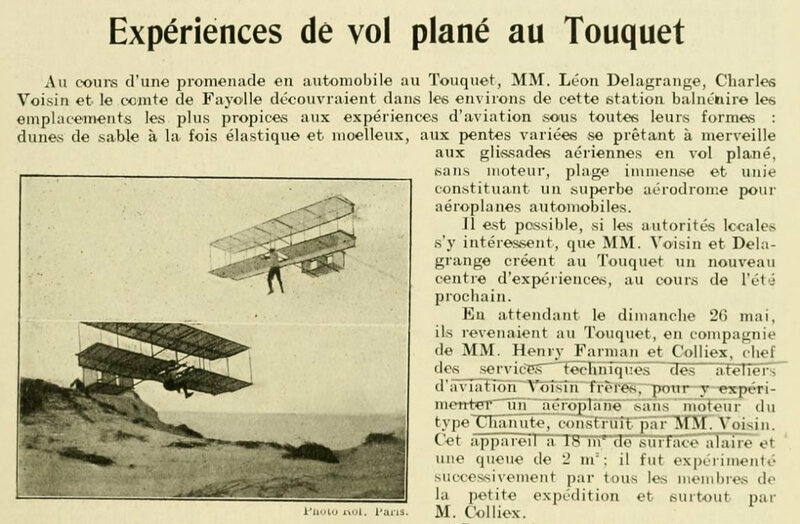 November 5  Leon Delagrange, France, makes a flight in a Voison-built aircraft and crashes just shy of 500 meters (1640 feet). During this flight, he makes a U-turn, the first turn a pilot has attempted in Europe. November 9  Henri Farman makes a flight 1030 meters (3380 feet), trying for the Grand Prix dAviation. This is the first time a European pilot remains airborne for more than a minute. Farman makes a complete turn, but the judges disqualify him because his wheels touch the ground before he completes the circuit. Orville Wright is present for this flight. 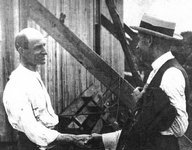 November 11  Wilbur Wright and Charlie Taylor depart Europe for New York City. Upon arriving, there is a message requesting Wilbur's presence in Washington, D.C. to meet with members of the US Department of War. Charlie goes on to Dayton, Wilbur to Washington. 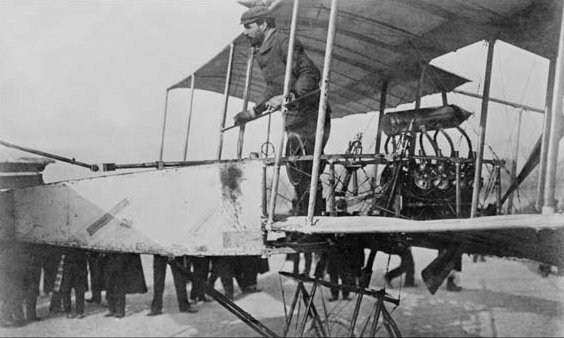 November 16  Louis Blériot flies 500 meters (1640 feet) in the Blériot VII. For the first time, his monoplane design is showing promise. On the same day, Robert Esnault-Pelterie, France, flies 600 meters (1969 feet) in his REP monoplane. November 17  Alberto Santos Dumont flies 200 meters (656 feet) in No. 19, the first of his diminutive monoplanes. This machine will evolve to become the Demoiselle, often considered to be the first ultralight aircraft. November 18  The German newspaper Lokal-Anzeiger publishes the accounts of Carl Dienstbach and Capt. Alfred Hildenbrandt confirming the Wrights' accomplishments. November 25  Wilbur Wright meets with Gen. James Allen, chief of the US Army Signal Corps, and Gen. William Crozier and Maj. Lawson Fuller of the US Board of Ordinance (the procurement arm of the Department of War) to discuss the capabilities of a Wright aircraft. December 4  Orville Wright departs Europe for New York City and Dayton, Ohio. December 5  Wilbur Wright agrees with Gen. James Allen that the Wright brothers can provide an airplane capable of carrying a pilot and a passenger for $25,000. 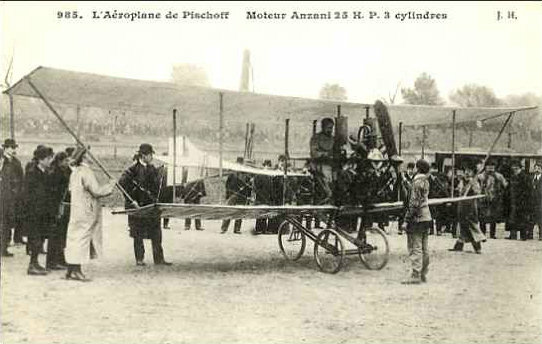 On the same day, Alfred de Pischoff, a Hungarian inventor working in France, tests a tractor biplane. The biplane is makes only a few short hops, but it is the first aircraft powered by an air-cooled Anzani engine, designed by Alessandro Anzani, Italy. 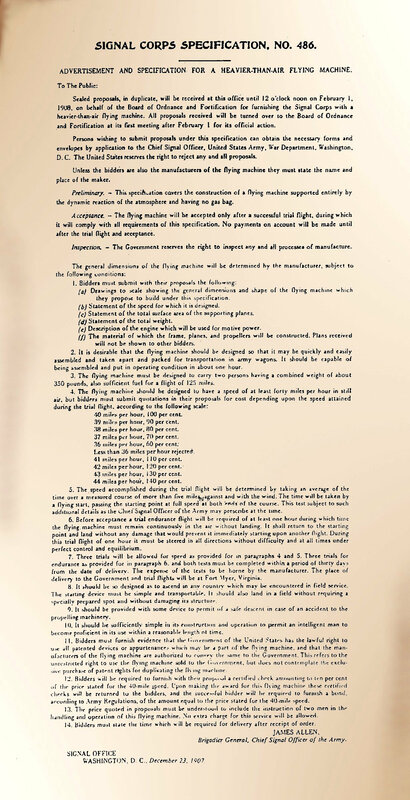 December 23  The United States Department of War, Board of Ordinance, finally convinced that the Wrights can do what they say they can do, issues a list of specifications for a flying machine. The Voison brothers Chanute-style glider. 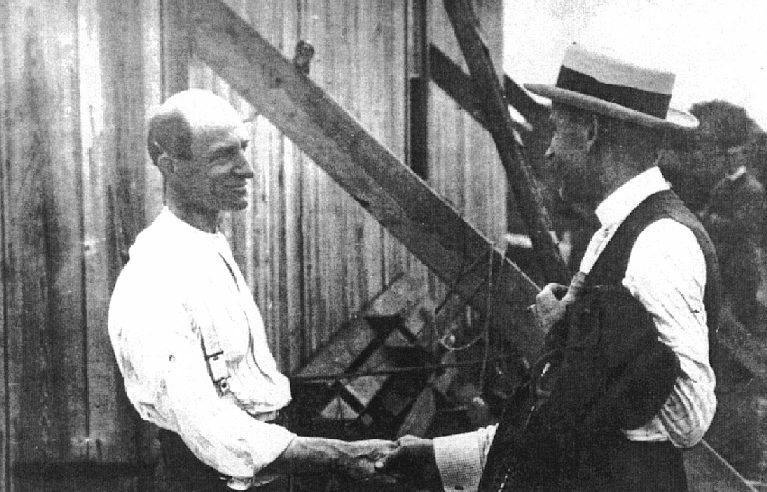 Wilbur Wright greets Charley Taylor in France. The camber (curve) of the wings on Dunne airplanes was not constant; it changed along the span. This helped stabilize the aircraft in flight. 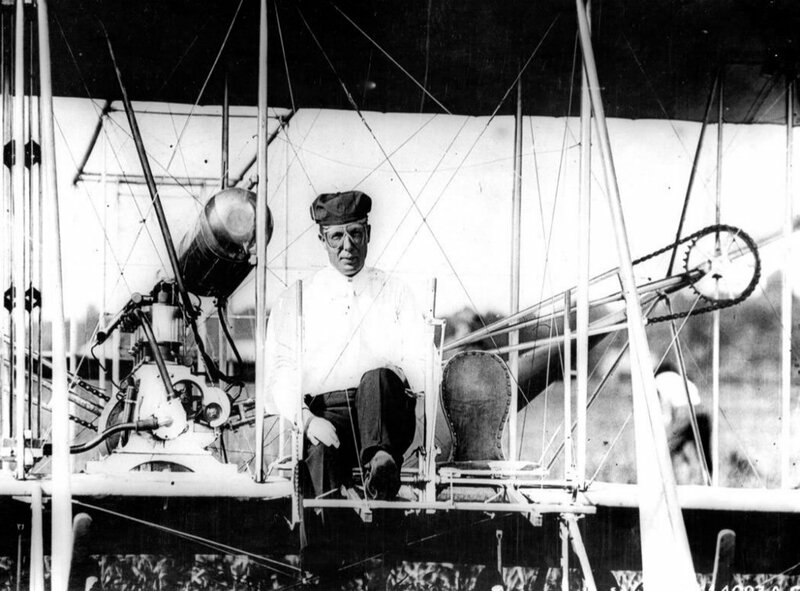 Captain Charles deForest Chandler in a Wright airplane. 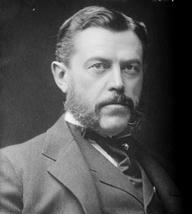 Originally the Aeronautical Division consisted of only Chandler and two assistants. 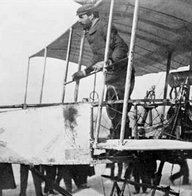 Henri Farman preparing for takeoff in his unmodified Voison – note the double-surface canard at the front. Henri Farman winning the Coupe Ernest Archdeacon after modifying his Voison and flying nearly half a mile. 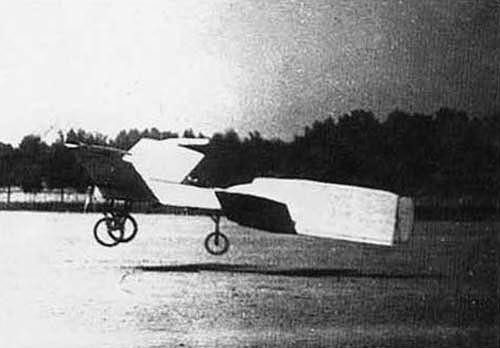 Leon Delagrange's Voison crashed on its first flight, and Delagrange immediately purchased another. 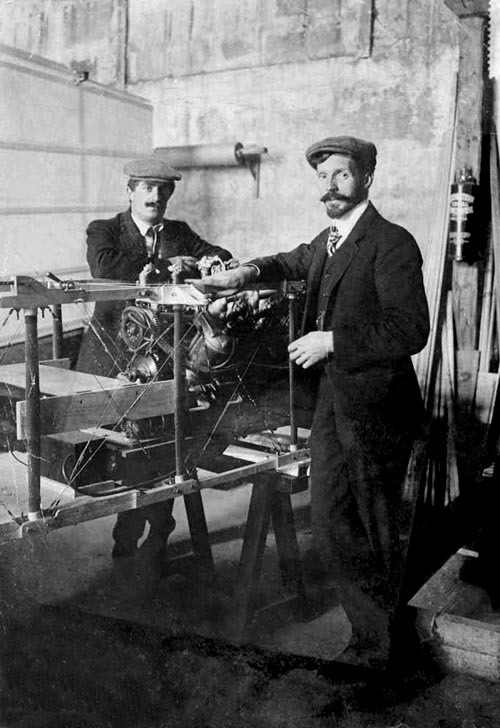 Henri Farman (right) confers with Charles Voison (left). The REP I had two tandem wheels, like a bicycle. Wheel rims at the wingtips kept the wings from dragging on the ground. Santos Dumont's Demoiselle is sometime referred to as the first ultralight aircraft. It was so small and light that the pilot ferried it to and from his workshop on the back of a modified automobile. 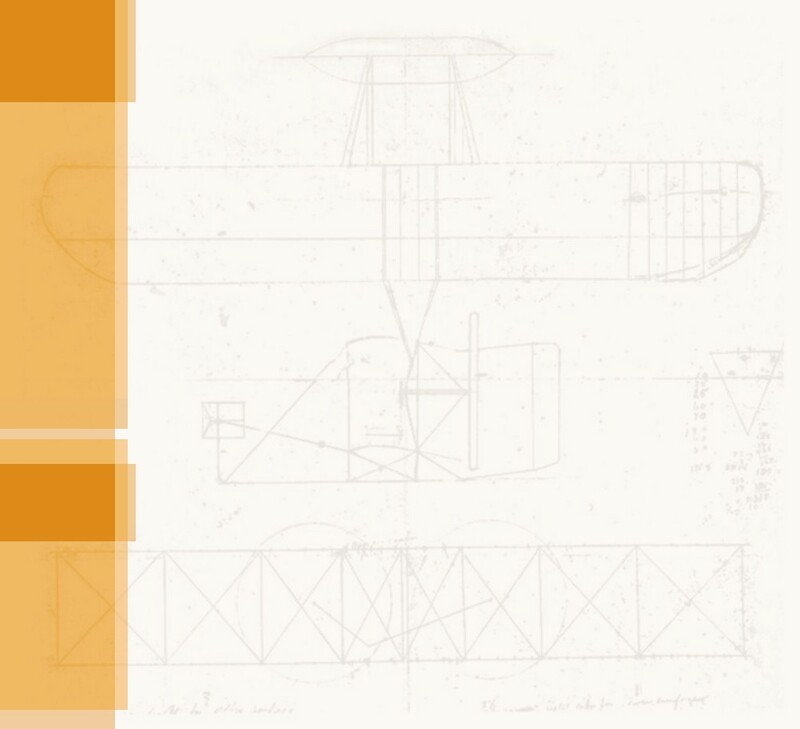 The shape of things to come – Pischoff's tractor biplane. 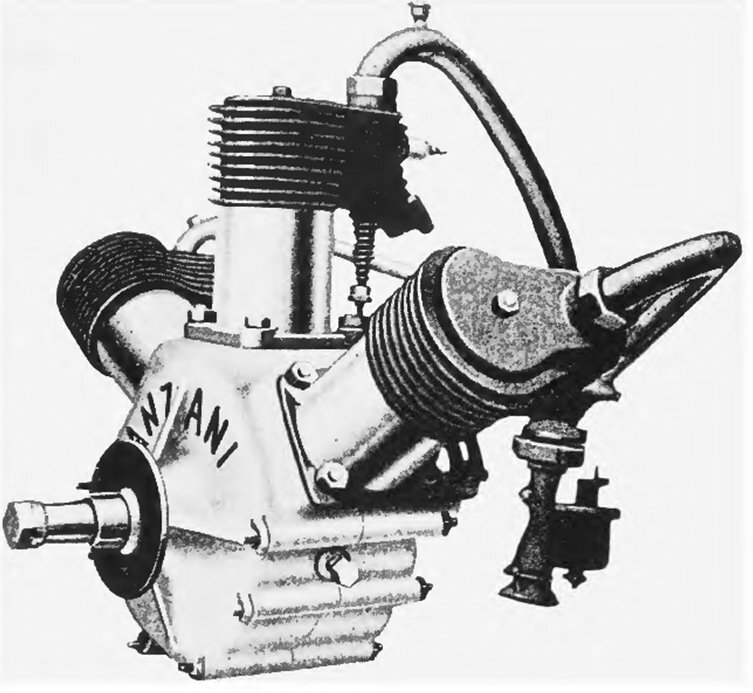 Like the Antoinette engines, the Anzani was a leap forward in aircraft propulsion. It eliminated the weight of the radiator and the water needed to cool the running engine. ...and crashes almost immediately. 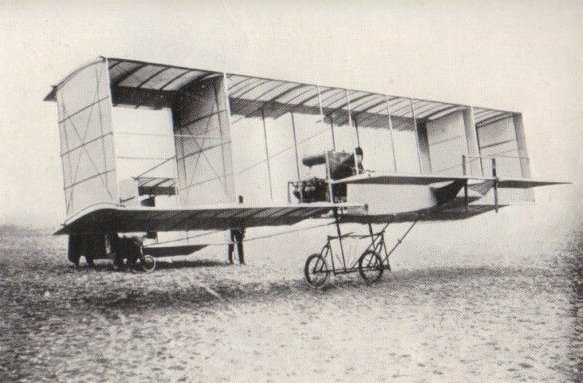 Still, this was Blériot's most successful airplane to date. 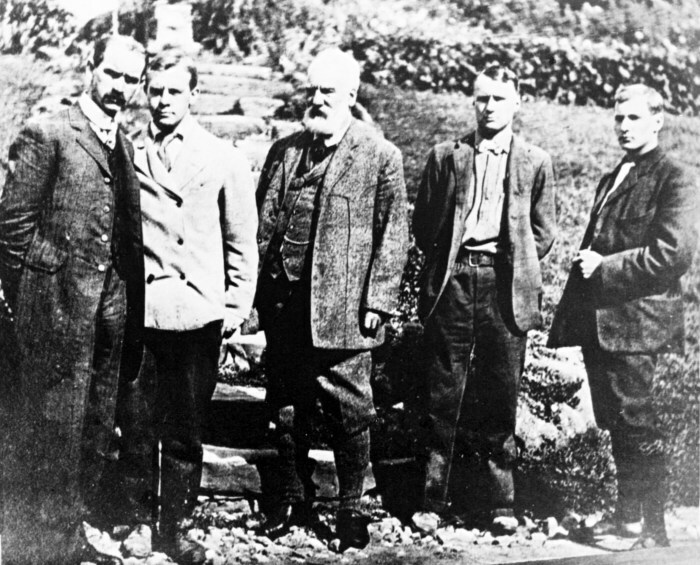 The Aerial Experiment Association (AEA) from left to right: Glenn Curtiss, Casey Baldwin, Alexander Graham Bell, Lt. Thomas Selfridge, John McCurdy. 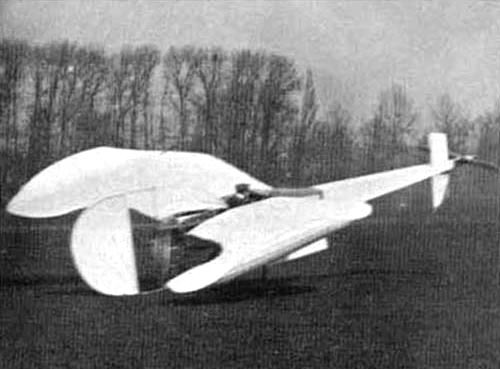 The Blériot VI in flight. Henri Farman had been an artist, cyclist, and race car driver before he turned to aviation. 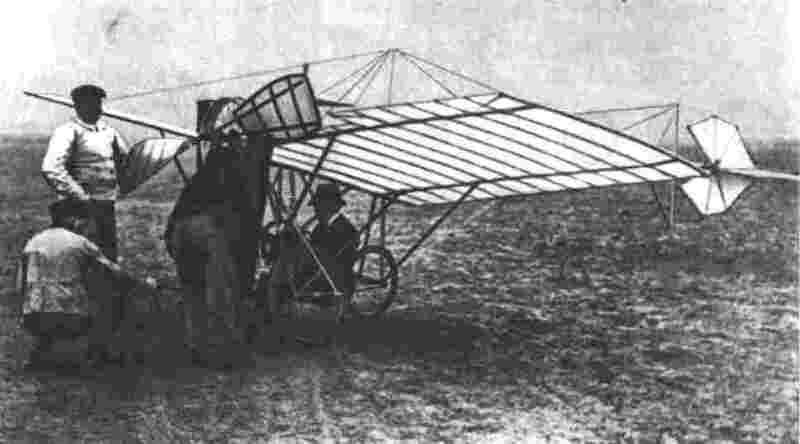 Farman's second Voison had removable side curtains between the wing bays. 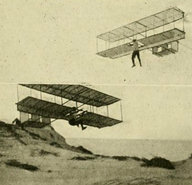 Farman often flew with all or most of them removed. 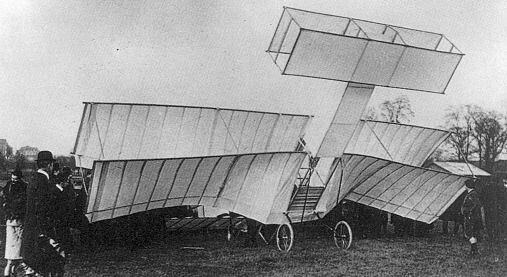 With its covered fuselage, the Blériot VII began to look like a modern monoplane. 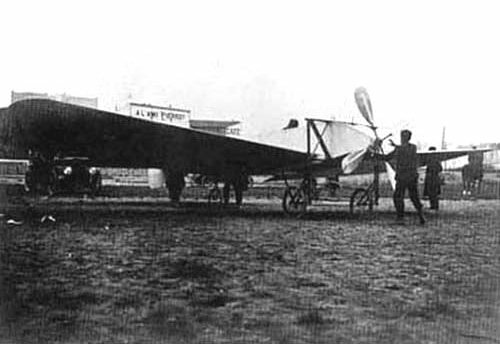 The Blériot VII from the front, showing its 4-bladed propeller. The Santos Dumont No. 19. This was the first of his diminutive monoplanes, the Demoiselle. 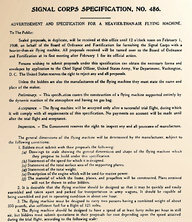 Signal Corps Specification No. 486, specifying a heavier-than-air flying machine.